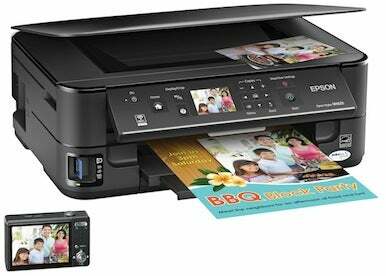 Epson added the Stylus NX625 to its line of all-in-one inexpensive printers on Wednesday. The model includes some high-end features at a low-end price. The NX625 boasts an impressive 15 pages per minute black-and-white and 7.2 pages per minute of color. Though the model does support double-sided printing, Epson says the feature is not supported on the Mac. The scanning resolution of the NX625 is 2400 ppi, and the unit features a new 2.5-inch LCD display. In addition, there’s support for memory card printing and in-printer photo retouching. The printer works over both Ethernet and 802.11n wireless, though Epson also says that Mac users won’t be able to access memory cards while the printer is on the network. The new $150 NX625 compares mostly favorably to Epson’s $100 NX420, which the online Apple Store offers as an add-on with the purchase of a new Mac; the biggest selling point in favor of the NX420 is Apple's rebate. The NX625 will be available later this month from Epson and retail stores.